The staff are Helpful-Near city center-Clean-Big rooms-they gave us a fruit basket and a bottle of champagne. I really enjoyed to stay in this hotel. The staff are very friendly and very helpful. We had a huge appartment with two rooms, that was very comfortable for me and my friend to live separately. The kitchen in the room was clean, all plates,cups, silverware are white and clean, we have also kettle and stove for cooking. We had cleaning service, they come every day, so our appartment was very fresh and clean. There are a lot shops and supermarkets around the hotel, so you can buy food and cook in your room. Good location, very close to the centre, good wi-fi in lobby. The apartments are large, spacious and comfortable with a huge balcon. Very spaceful and nice to live in. Beds and pillows were also comfortable. Service was fantastic. We felt us like home everywhere! The staff are super friendly, corteous and offered valuable input regarding where to go and how to get where. The food at the restaurant was very delicious no matter what you ate. Also we liked the wine selection and the drinks in the bar. Many thanks to the Cook and the Bartenders. The restaurant was also kept very clean and tidy. The location of the property was convenient. Easy to reach, good location for all what we needed. The hotel offers also a professional massage services. In the Lobby area there is also a small grocery store which is open from the early morning to late evening. If you are travelling alone, with a spouse, friends or family or if you need the accommodation for a group, I higly recommend this hotel to you. Thank you very much! The location was ok. But everything els was so so bad... I would never recommend anybody to say at this hotel. The staff where rude, the beds where very small for a normal size adult. If you are over 6 feet forget about sleeping there. The location of the building close to the town and shop's and the manager was so nice when I complaint about first apperment was to small he moved me into bigger apperment on next day. Reception guy's so nice except the bar staff not. Friendly and helpful staff, everyday cleaning, a lot of shops and cafes nearby. Nothing much. Good cleaners, They deserve more money. location is very good, easy walk to everywhere. Staff was friendly And helpfully. Our room And balkony was big. Wifi was work well in lobby. One of our top picks in Alanya.Kleopatra Tower is located in the center of Alanya , 1,300 feet from Kleopatra beach. 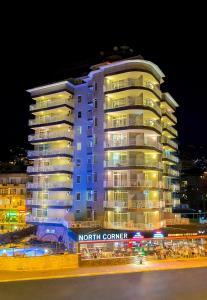 It offers apartments with wide balconies and free Wi-Fi in public areas. 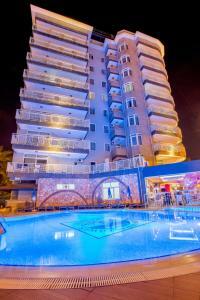 All of the apartments at Kleopatra Tower are air conditioned and have kitchenette facilities. The hotel has an outdoor pool, a children’s pool and a children’s playground. 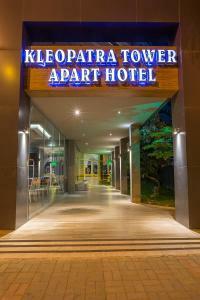 Kleopatra Tower has a restaurant with an a la carte menu. 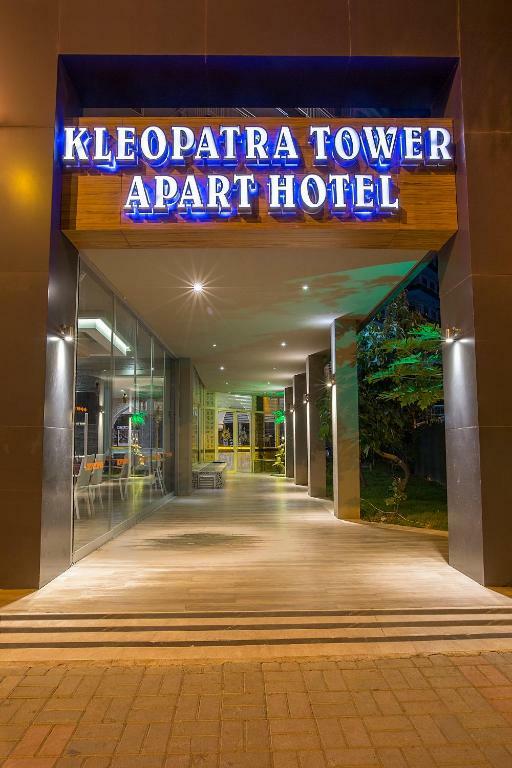 When would you like to stay at Kleopatra Tower Apart? This apartment features a bedroom, a living room, a electric kettle, kitchen. House Rules Kleopatra Tower Apart takes special requests – add in the next step! Kleopatra Tower Apart accepts these cards and reserves the right to temporarily hold an amount prior to arrival. Please note that air condition is available for a fee. When the number of guests is 15 or higher, breakfast is served as an open buffet. A continental breakfast is served when the number of guests is less than 15. Nothing meet anystanard ... Towel dirty, bed sheets toredof, living room no AC not fan, AC no remote control, in their ad they say free With Fi I called front seat he says it is only in lobby, shower door is broken, for my colleague there is no Towel even the towel exist is dirty and tired off. I've booked for 2 person. I paid on arrival for 2 nights after one night I left the place. Because I can't stand it it is not clean at all the ads was very much faked. I paid for one week staying when I went to the hotel. They didn't give me a receipt. I asked but I didn't receive it. The same in June. I’m really disappointed with the service at the apartment. Everything about it was bad. I only positive thing about this apartment is the location to the beach apart from that stay away.. the WiFi was so so bad you can’t get WiFi in your room only in reception area. Even that it was so bad!! 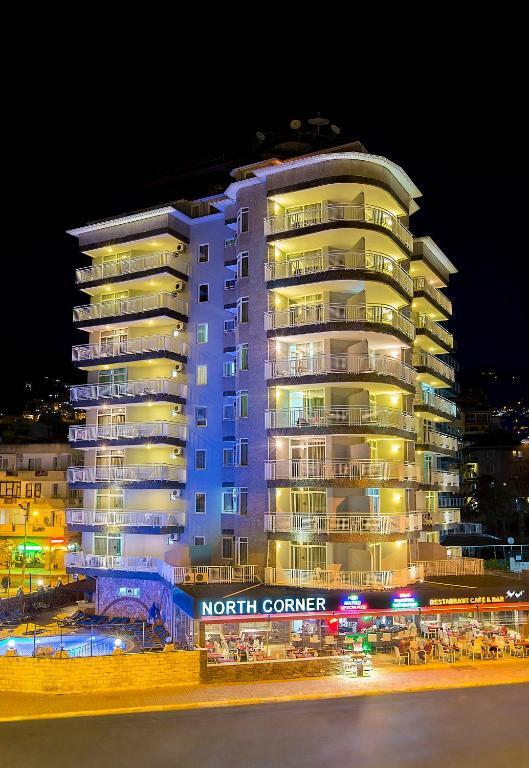 I’ve been to Alanya 3 times now this is the worst place by far. If the owner sees this comment tell your staff at the bar to focus on there jobs instead of trying chatting up tourists girls. I was waiting for a drink at that bar for about 15mins. It’s only me at the bar the worker where too busy trying to chat up girls!! There is no wifi in the room, a/c is for extra fee. We booked a suite and turned to be a double room.They changed it after an argument.They charge on ac. Staff, atmosphere, music, food. Especially the lovely night receptionist, always friendly and smiling.